"If you haven't read Thompson, you don't know Hammett," says publisher Vince Emery. Hammett's Moral Vision is the single most influential full-length investigation of Dashiell Hammett's novels, even though it has never been available in book form - until now. First serialized in seven issues of The Armchair Detective magazine, Hammett's Moral Vision has affected almost all subsequent analyses of Hammett's work. But people could read Hammett's Moral Vision only by digging up all seven tough-to-find issues of Armchair Detective, and only for collector's prices of more than $100 per set. Now Hammett's Moral Vision is available as an affordable book, updated, and with a new introduction by William F. Nolan, the Edgar Award winning author of Hammett: A Life at the Edge and Logan's Run. In addition, a new chapter by George J. "Rhino" Thompson explains how reading Hammett changed his life, and what he did after writing Hammett's Moral Vision. 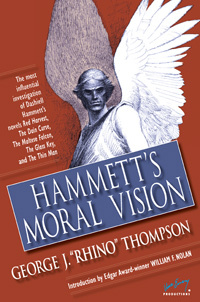 The heart of the book is Thompson's analysis of five Hammett novels: Red Harvest, The Dain Curse, The Maltese Falcon, The Glass Key, and The Thin Man. He examines each one in detail, and compares what others have written about the novels with his own insights. "One of the most intelligent critics of Hammett's work." [Hammett's Moral Vision is] "incredibly well done, beautifully researched, and displaying tremendous insight into what made Hammett tick as a writer. … [Thompson's] vision is timeless." "Hammett continues to thrill and fascinate mystery readers and writers, and Thompson's work offers deep insight into his novels." "Given its high quality and influence on later Hammett critics, it's surprising this pioneering study has not appeared previously in book form." "The latest installment in Vince Emery's Ace Performer series is subtitled The Most Influential In-Depth Investigation of Dashiell Hammett's Novels, and he's not kidding. It's not only arguably the most influential but also perhaps the first and certainly one of the shrewdest, detailed, and best-written. This volume collects the long sought-after seven-part essay that originally appeared in The Armchair Detective back in the early seventies, plus an intro by Hammett biographer/crime novelist William F. Nolan and a new chapter in which English professor-turned-cop Thompson discusses the impact Hammett has had on his own life." A professor's recommendation that he write his doctoral dissertation on Dashiell Hammett led George J. "Rhino" Thompson, the author of Hammett's Moral Vision, to change careers from university English teacher to police officer. He later became the best-selling author of Verbal Judo: The Gentle Art of Persuasion and the founder and president of the Verbal Judo Institute. "Rhino" has been featured on network news on NBC, ABC, CBS, CNN, and Fox, and on the TV programs 48 Hours, Inside Edition, In the Line of Duty. He lives in upstate New York. His website is www.verbaljudo.com. Hammett's Moral Vision is the third title in The Ace Performer Collection, a series of books by and about Dashiell Hammett, crowned "the ace performer" by his disciple Raymond Chandler. Boring legal stuff: Copyright 1995-2007 Vince Emery Productions. "Vince Emery" is a registered trademark of Vince Emery Productions. "Vince Emery Productions," "emerybooks.com," and the Vince Emery signature are trademarks of Vince Emery Productions. So there.